Dai Pai Dongs are popular sidewalk food stalls in Hong Kong during the 50's and 60's. Rows of them resided compactly along the road sides, serving a variety of foods. Yuan Yang is a typical Dai Pai Dong styled drink. Dai Pai Dong Instant 3-In-1 Yuan Yang Mix is made of the finest grade instant tea, instant coffee, sugar, milk and is created for the convenience of customers. Directions: Empty contents of one sachet into a tea cup. Pour in around 170 ml boiling water and stir. Allergy Advice: Contains Soybean, Milk. Ingredients: Sugar, Creamer (Corn Syrup Solid, Partially Hydrogenated Vegetable Oil (Soybean), Sodium Caseinate (Milk), Stabiliser (E340(ii)), Emulsifiers (E471, E481(i), E322 (Soybean)) (36%), Dai Pai Dong Instant Coffee (5%), Dai Pai Dong Instant Ceylon Tea (2%), Anti-caking Agent (E551). 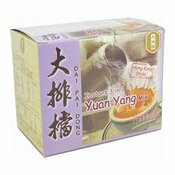 Simply enter your details below and we will send you an e-mail when “Instant 3 in 1 Yuan Yang Mix (Coffee Tea Mix) (大排擋三合一即溶鴛鴦)” is back in stock!